Jacopo Tintoretto (c 1518-1594), The Last Supper (E&I 95) (c 1563-64), oil on canvas, 221 x 413 cm, Chapel of the Sacrament, San Trovaso, Venice, Italy. Image by Sailko, via Wikimedia Commons. 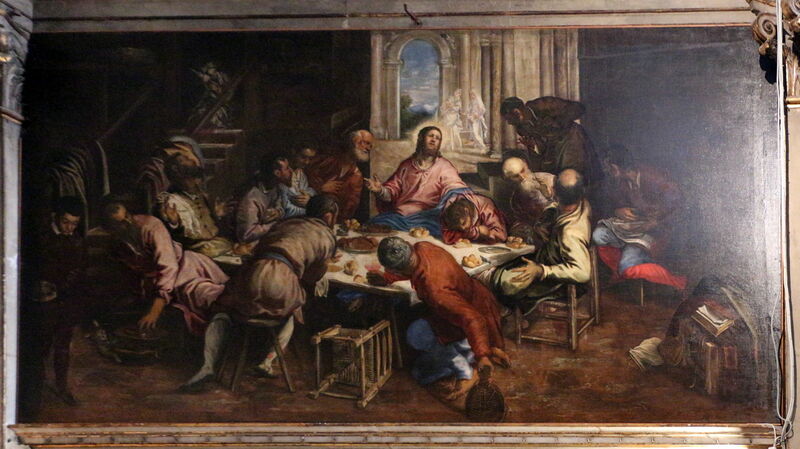 By 1560, Jacopo Tintoretto’s paintings had come to dominate the interior of the Madonna dell’Orto in Venice. I am only sorry that I have been unable to locate images of the five Virtues (one of which is now a later replacement) which completed his paintings there for the time being. However, these had not brought him much income, being supplied at near cost price. He began a more concerted campaign to win himself work from one of the richer of the Venetian fraternities: the Scuola Grande di San Rocco. Over the next few years, his paintings came to grace more of the churches in Venice. 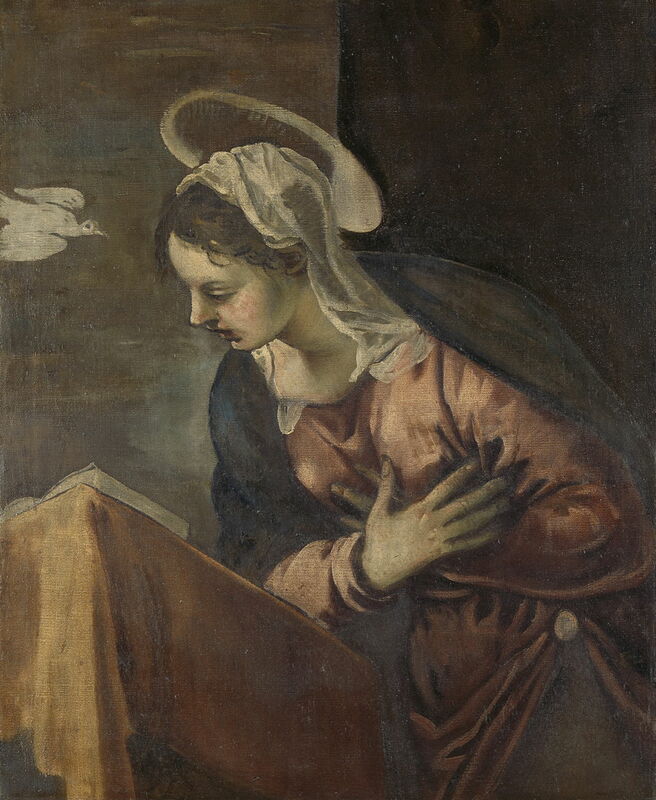 In 1560, he painted a large organ shutter of the Annunciation to the Virgin for San Benedetto, which was later cut into sections; four fragments remain. 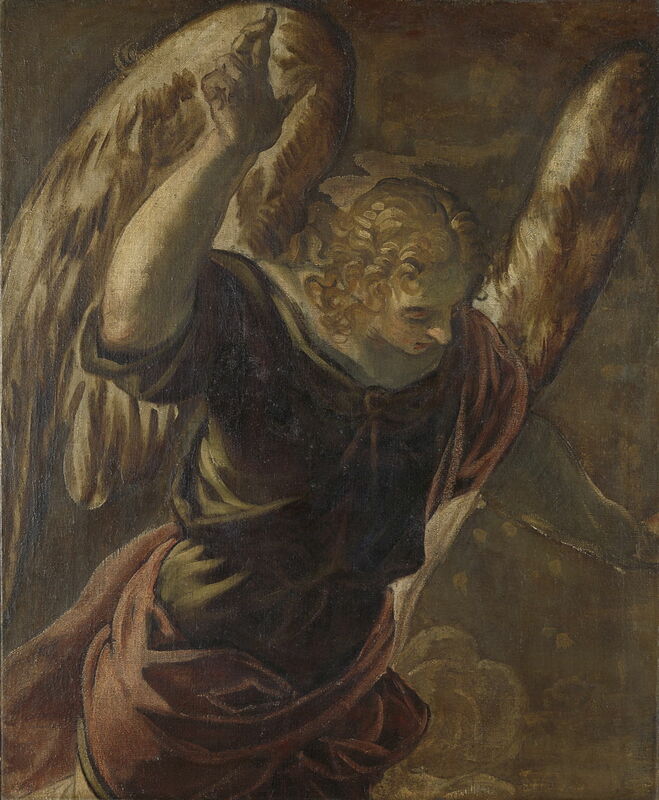 Jacopo Tintoretto (c 1518-1594), Angel, fragment from the Annunciation to the Virgin (E&I 85) (1560), oil on canvas, part of organ case, 115 x 93 cm, Museum Boijmans Van Beuningen, Rotterdam, The Netherlands. Wikimedia Commons. Because these fragments are of more modest size than the original canvas, it is perhaps easier to see his very painterly style in them. This Angel (E&I 85) is formed from what appear to be quick brushstrokes, which are most visible in the hair and its wings. The drawing of its right hand and arm is clean and resolute, with little time being spared to adjust or rework. Jacopo Tintoretto (c 1518-1594), Virgin Mary, fragment from the Annunciation to the Virgin (E&I 86) (1560), oil on canvas, part of organ case, 117 x 94.5 cm, Museum Boijmans Van Beuningen, Rotterdam, The Netherlands. Wikimedia Commons. Another fragment shows the Virgin Mary (E&I 86). For such a central figure, she lacks the painstaking finish normally seen in religious works of the time. 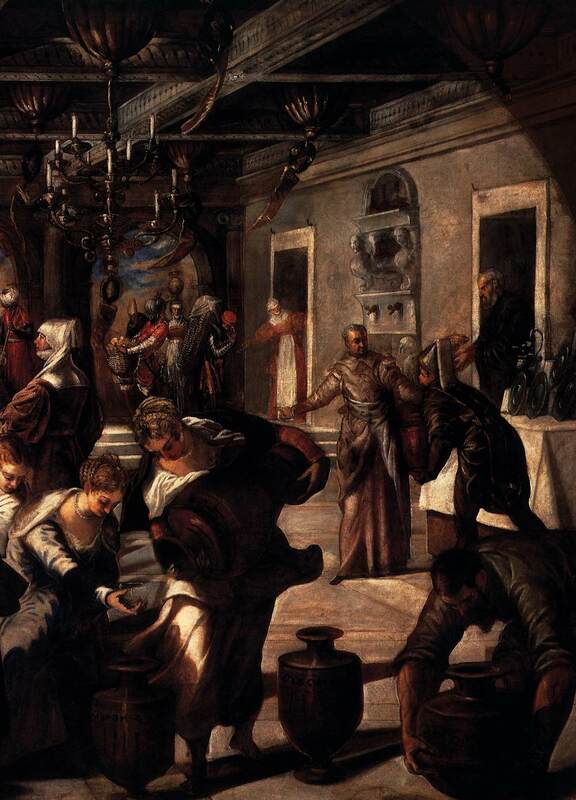 Jacopo Tintoretto (c 1518-1594), The Wedding at Cana (E&I 89) (1561), oil on canvas, 435 x 535 cm, Basilica di Santa Maria della Salute, Venice, Italy. Wikimedia Commons. In 1561, he designed another very large work showing The Wedding at Cana (E&I 89), which is thought to have been painted mainly by his studio and not his own hand. Described in the gospel of John, but not the three other gospels, tradition holds that this was the first miracle performed by Jesus, in which he turned water into wine. 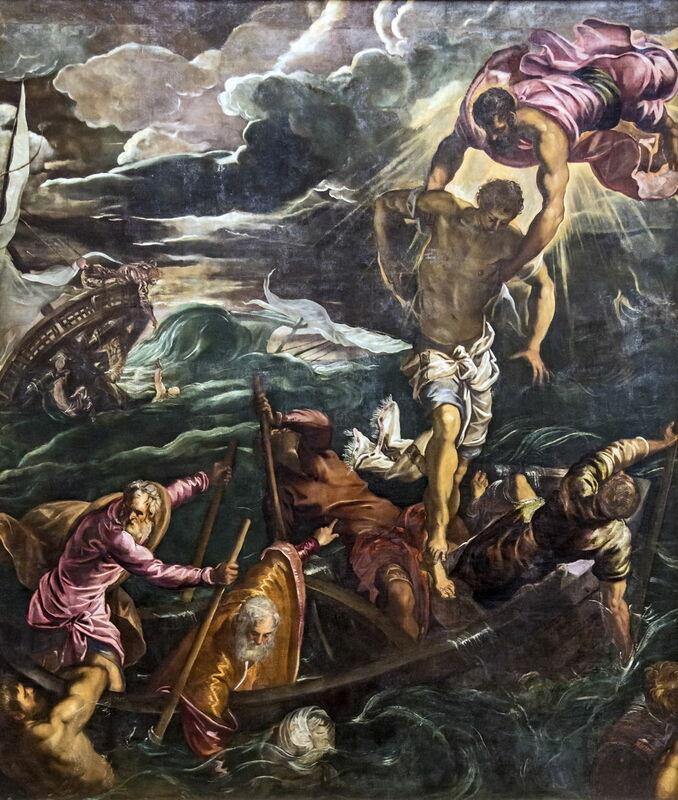 Tintoretto adopts an interesting composition and a traditional style. The single-point perspective comes to a vanishing point directly above the head of Christ, in a markedly asymmetric position well over to the left. This balances the other main point of interest, where a small group of women are pouring water in the right foreground. The assumption is that this is being turned into wine, although this isn’t particularly visually clear, even in the detail below. Jacopo Tintoretto (c 1518-1594), The Wedding at Cana (detail) (E&I 89) (1561), oil on canvas, 435 x 535 cm, Basilica di Santa Maria della Salute, Venice, Italy. Wikimedia Commons. I also wonder whether Tintoretto has included a self-portrait, in the figure standing in front of the doorway close to the right edge. The following year, Veronese started work on his own Wedding at Cana (1562-63), now in the Louvre, the more famous of the two very large paintings. The city of Venice has an interesting association with the Wedding at Cana, as tradition holds that Mark, the city’s patron saint, was one of those serving at that wedding feast. Jacopo Tintoretto (c 1518-1594), The Assumption of The Virgin (E&I 90) (c 1563), oil on canvas, 437 x 265 cm, Obere Pfarrkirche Unsere Liebe Frau, Bamberg, Germany. Wikimedia Commons. 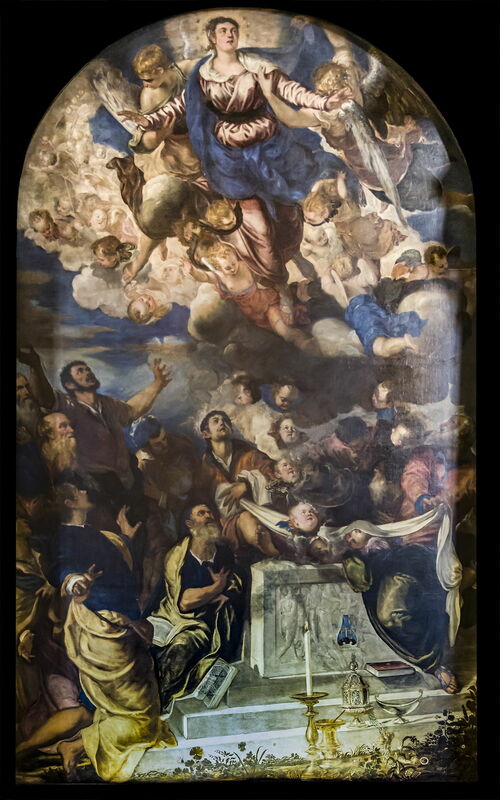 Tintoretto followed this with two further paintings of The Assumption of The Virgin. This (E&I 90) is the version now in Bamberg, Germany, and is officially dated to the “early to mid 1560s”. Passages are reminiscent of his recent work for the Madonna dell’Orto in Venice: the swirl of angels at the top, in particular. It is considerably lighter and more dynamic than his Assumption for San Stin in the early 1550s, which I showed previously, and lacks the multitude of infant heads too. Jacopo Tintoretto (c 1518-1594), The Assumption of The Virgin (E&I 91) (c 1563), oil on canvas, 440 x 260 cm, Cappella di Santa Maria Assunta, Gesuiti, Venice, Italy. Image by Didier Descouens, via Wikimedia Commons. Those infants return in the quite different version of The Assumption of The Virgin (E&I 91) which he painted at about the same time for the Cappella di Santa Maria Assunta, in the Gesuiti. 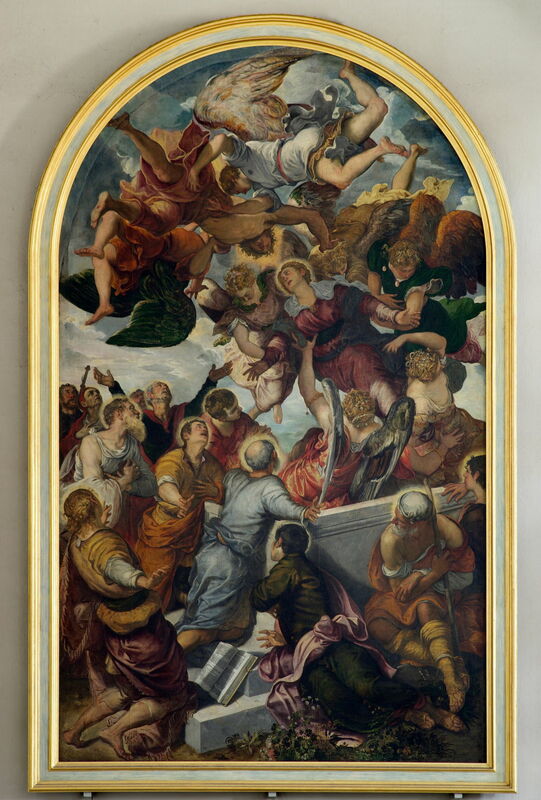 It is thought that Tintoretto had promised to paint this work in the style of Veronese, which may explain its apparent reversion. 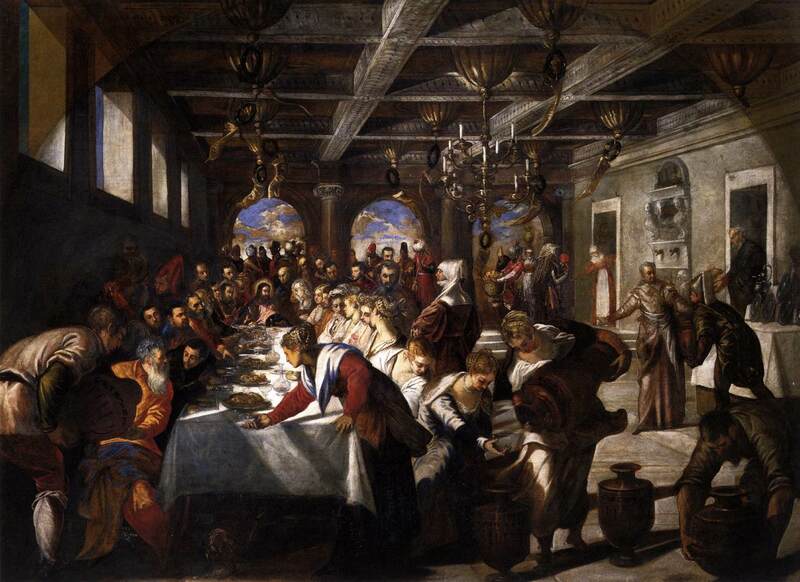 Tintoretto cast tradition aside in his next painting of The Last Supper (E&I 95), thought to have been made in about 1563-64, for the Chapel of the Sacrament, San Trovaso, in Venice. This is so radically informal that it still shocked John Ruskin when he saw it three centuries later. Jesus is shown at a very informal occasion, leaning back and talking beside an almost square and low-set table. Twelve disciples sit, lounge, slump and lean around the table, of which one at the right is even eating his meal from his lap. There’s a rough assortment of seating, with a chair resting on its side under the table, as if hurriedly abandoned, which is perhaps a reference to Judas Iscariot. The disciple at the far left is doing something to a serving dish which appears to contain a rabbit; to his left is a boy. In the far distance behind Jesus are two figures apparently seen in a vision, and over to the right is a pile of books and possessions. Almost at the top of the stairs, at the centre left, a woman sits, resting her head on her hands. The informality and lack of symmetry are radical breaks from tradition, and show a Christ of the people – a theme which wasn’t properly explored again for over three hundred years. No wonder Ruskin was taken aback. In about 1564, Tintoretto painted a series of three works showing episodes in the involvement of Saint Mark with the city of Venice – for the Scuola Grande di San Rocco at last. I haven’t been able to locate an image of his Finding of the Body of Saint Mark (E&I 97), which is now in Brera, Milan, but show the two works which are now in the Gallerie dell’Accademia in Venice. Jacopo Tintoretto (c 1518-1594), Removal of the Body of Saint Mark (E&I 96) (1562-66), oil on canvas, 398 x 315 cm, Gallerie dell’Accademia, Venice, Italy. Image by Didier Descouens, via Wikimedia Commons. Saint Mark the Evangelist and author of the gospel is thought to have died in what is now Libya in 68 CE. According to the Golden Legend, he was martyred in Alexandria, and Tintoretto’s Removal of the Body of St Mark (E&I 96) shows a small group of local Christians securing the body for burial in the catacombs there. Divine intervention in the form of a storm provided their cover. 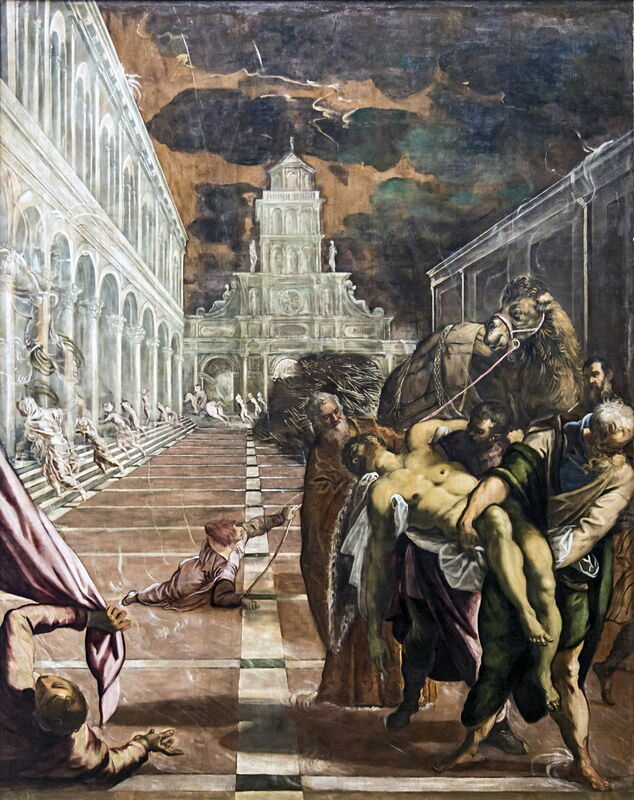 In 828, two Venetian merchants are thought to have located the saint’s remains and taken them back to Venice, which Tintoretto shows in his Finding of the Body of Saint Mark. When the new basilica of Saint Mark was being built to house those remains in 1063, they could not be found; the following year, says tradition, the saint appeared and revealed their location, so that they could be laid to rest in a sarcophagus in the new basilica. Jacopo Tintoretto (c 1518-1594), St Mark Rescues a Saracen (E&I 98) (1562-66), oil on canvas, 398 x 337 cm, Gallerie dell’Accademia, Venice, Italy. Image by Didier Descouens, via Wikimedia Commons. St Mark Rescues a Saracen (E&I 98) is another stormy nocturne, this time showing a story from the Golden Legend in which the saint is claimed to have saved a ‘Saracen’ (an Arab) from drowning in a shipwreck, as he made a vow that if so rescued, he would be baptised as a Christian. After his rescue, the Saracen failed to meet his promise, so Saint Mark appeared and reminded him of his vow, and the Saracen went to Venice and was baptised in the name of Mark. Tintoretto’s commission for these paintings didn’t come directly from the Scuola Grande di San Rocco, but from a patron, Tommaso Rangone, who had independent tastes and means. In return for his support, Rangone appears in each of the paintings: he is the bearded man holding the shoulders of Saint Mark in the Removal, and holds two oars at the helm of the boat in the Rescue of a Saracen. Tintoretto still had to win his commission from the Scuola itself – which will be the subject of my next article about his work. Posted in General, Life, Painting and tagged history of painting, narrative, painting, Ruskin, Tintoretto, Venezia, Venice, Veronese. Bookmark the permalink.